Our integrated plant health care programs are designed specifically to get at the root of the problem. To accomplish this, we follow the principles and practices of Integrated Pest Management (IPM) and focus on the long-term health of your plants. IPM programs are combined with our environmentally-responsible, holistic approach to create a customized, unique program to maximize the health and beauty of your landscape. We believe in being proactive in preventing insect infestations and disease outbreaks in our customer’s trees and shrubs. 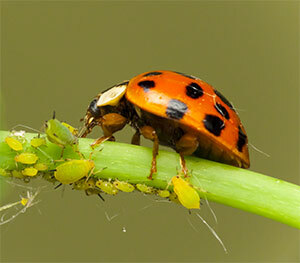 This starts with identifying the pest risk for plants before it becomes an overwhelming issue. Carefully monitoring and assessing the new or existing pest situation ensures action is taken as soon as possible to prevent further outbreak. Above all, prevention is the best medicine and the ideal option when it comes to proactive insect and disease prevention. To help minimize any damage to your trees and shrubs due to insect or disease, we work to ensure the landscape is healthy and that the direct environment around the plant is not stressed. This means that the primary stress contributors (soil, water and nutrient levels) of a plant are effectively managed and kept in balance. When this is accomplished, risk of pest and disease infestation is reduced, as is the need for traditional pesticide use over time. To be effective, an IPM program must be able to identify the host plant and the insects that commonly affect them. Our highly-trained staff properly identifies the plant material and pests to develop a program to achieve your goals. When you sign up for our IPM Plant Health Care program, our technician makes multiple visits to your property to monitor the health of your trees and shrubs. This allows us to monitor the progress and stay proactive in protecting your plants. We understand that people have different views when it comes to the use of pesticides on their property. Together with your input, we develop a plan that determines the actions taken. Our main goal with any IPM Program is to prevent damage to your trees and shrubs. Our programs are designed to make sure your plants have the proper water, nutrients and soil amendments for their ideal growth and overall health. Keeping your trees and shrubs healthy is the first step to preventing insect pest problems. IPM programs are designed to keep your trees and shrubs looking there best while using fewer pesticides. Donovan Arborists’ IPM Programs combine techniques to effectively manage the pests while causing less damage to the beneficial insects. Paul Donovan is an ISA (International Society of Arboriculture) Certified Arborist with over 21 years of experience working in the Colorado Front Range and Denver metro area. To get in touch with him and discuss your next steps for preventing and eradicating plant pests and disease, call 303-623-8733.